I need a few Thank You cards for my stash and so I dug out this old Hero Arts background stamp. I inked and embossed then just added the sentiment and some sequins..
Quick post today as I have lots to do. Have a great week. I have had time to play with my stamps today and created this note card, I plan to make a set of them for a friend. This card uses some old favorite Hero Arts stamps plus the new Engraved Frame stamp. The background is created from lots of distress inks water and the Classic Fabric Cling. The butterflies are from the Antique Engravings set. This card is for two challenges the Nature Challenge at Hero Arts and the Things That Fly challenge at Simon Says. At last its beginning to get warmer and Spring is definitely in the air. I am looking forward to brighter days and have made this card with Summer in mind. Lots of old Hero Arts favorites here, the lovely Hydrangea stamp and the butterfly from the Antique Engravings set. This card is for two challenges, the "Nature Challenge" at Hero Arts and the "Girly Challenge" at Simon Says. After seeing Lucy's card on the Hero Arts Blog I was inspired to make another Shaker Card, this time using a Hero Arts Silhouette Butterflies cut file. I re sized the image and cut from some Bo Bunny paper. The background patterned paper is BasicGrey and the Hello word die is also Hero Arts. A simple but effective design! I am adding this to the "Nature Challenge" over at the Hero Arts Blog. Also the "Girly" challenge at the Simon Says Wednesday challenge bog. Yeah its Friday, hope you all have a great weekend!! I am back in the swing!! At last I am back in the swing of card making and have three cards for you today, the first is using all my new Hero Arts stamps and is for the challenge "All Things Embossed Challenge "over at Virginias View. The background circle is stamped with the Tropical Background and the "Stamp your Own Plant" set. The embossing sentiment is added onto the vellum. 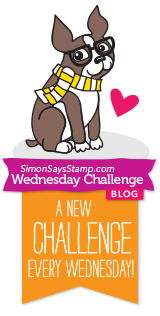 I am also adding this to the "Girly Challenge" over at the Simon Says Wednesday Blog. This second card is just a bit of fun, I have a new two new Stitched Die sets from Memory Box and had to play with them. The third card is another Shaker, just love making these, its a very simple design but all the sparkle makes me smile!! I am really in to Shaker Cards and decided to make one for my friends Grandsons 2nd Birthday. I found a really fun design in my Silhouette library with lots of balloons and streamers and knew it would be perfect. I am really pleased with the finished design, its such a sparkly card. I am adding this to the Simon Says Wednesday Challenge, "Anything Goes". Hope you are all having a great weekend, its a beautiful day here in Surrey, Spring is on its way! !